Golf is known for its well-mannered galleries, where volunteer ushers raise “Quiet” and “Hush” paddles and masses follow directions like well-trained retrievers. 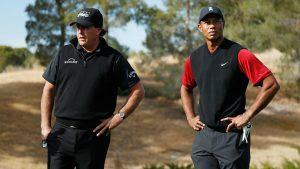 But it looks like champion golf hustlers Tiger Woods and Phil Mickelson found a much tougher crowd for their recent pay TV match at Shadow Creek in North Las Vegas. Woods and Mickelson, multimillionaire superstars of the sport, were pounded like golf course gophers in the wake of their pay-per-view spectacle, which ended after 22 holes with Mickelson winning the $9 million prize. If the two men are to be believed, it was a winner-take-all match. The spectacle wasn’t an important sporting event, if there is such a thing. It wasn’t even an overly intriguing one. But if you’re a rabid golf fan, you probably found a way to watch it. Mickelson’s credibility was dragged through the bunker after he became entangled in an insider trading scandal with Las Vegas sports betting legend Billy Walters. Walters went to the penitentiary. Mickelson got a mulligan and went back to work as the PGA’s biggest star. With the connection between gambling and golf so well known, you would think fans and the press would have more of a sense of humor about the sporting crowd soap opera at Shadow Creek. But think again. Perhaps, but according to published reports it drew a far larger paying crowd at $19.99 per subscription than anticipated. Despite reception glitches, refunds, and the mediocre quality of play by the stars of the sport, there was no shortage of customer interest. The magazine produced a piece titled, “The 7 silliest complaints about The Match between Tiger Woods and Phil Mickelson” that cuts through the roar of whining that echoed through the sport’s normally docile fandom. A favorite line from Busbee after Mickelson knocked down a putt to end the marathon trip to the dentist: “And we all left The Match feeling about like you feel after you drop off your cleaning: well, that’s done. But, if the money is right, there will be other opportunities. Contact John L. Smith at jlnevadasmith@gmail.com. On Twitter: @jlnevadasmith.